Brooke and Steve Giannetti stand at the entrance of their home. Steel-and-glass doors allow the eye to travel through the entryway to the gardens beyond. 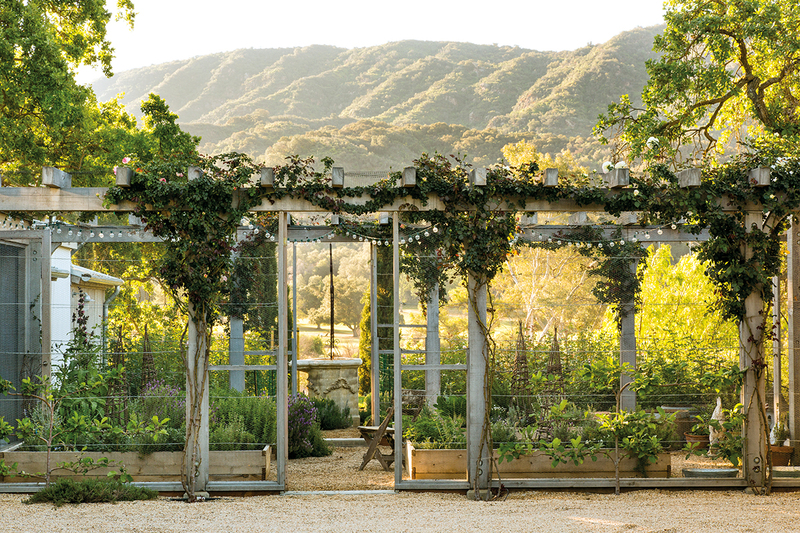 When Brooke and Steve Giannetti pulled up to a five-acre parcel of land tucked within California’s Ojai Valley, they felt an immediate connection—the kind, like the first rush of true love, that just won’t be denied. Although they were living in Santa Monica and both had grown up in urban environments (she in Los Angeles, and he near Washington, D.C.), the idea of transitioning to a rural lifestyle was a seed that had been germinating in their collective minds for quite awhile. Now, captivated by the picturesque landscape before them with its meandering pasture, stately oak trees, glorious mountain views, and abundant sunlight, they knew they’d found the path toward home. It was time to plant those pastoral roots, nurture them carefully, and allow them to grow. “I more or less sketched out the plans for our future house that first day,” says Steve, a much-sought-after residential architect. Whether they’re working on one of many design projects for clients across the country or crafting a home for themselves, the Giannettis believe every good house starts with a story. “The houses that we are drawn to again and again have usually grown over time,” says Steve, “and their mix of materials reflects an evolution. 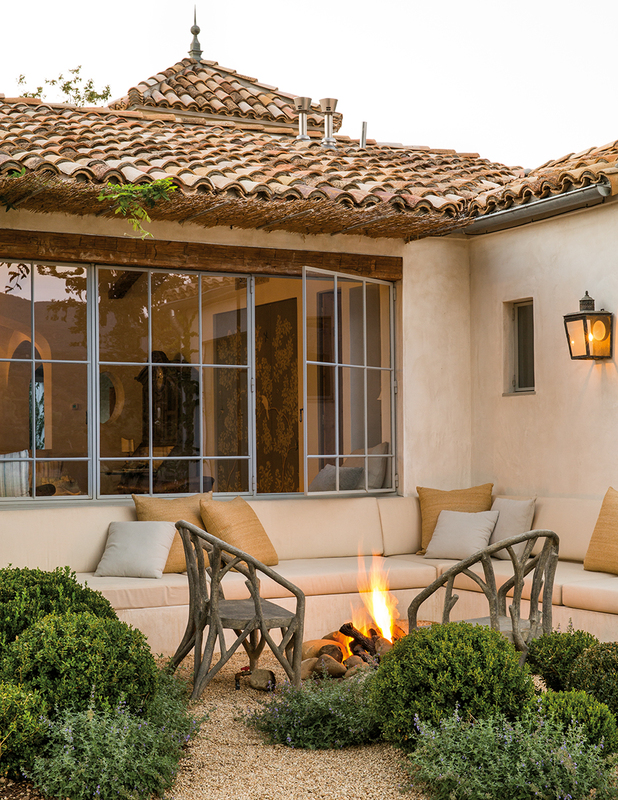 In this case we needed to create and compress that history.” Taking inspiration from Ojai’s local architecture that includes both Spanish Colonial–style buildings and wood-clad farmhouses with tin roofs, a narrative for Patina Farm began to emerge. The “original” main part of the house was given thick plaster walls and an antique-tile roof they found in France, while the wings, made to appear as though they could have been added later, were wrapped in gray cedar, with galvanized metal roofs similar to neighboring farms. “When two materials are put together that are vastly different it breaks up the mass of the house so it doesn’t feel quite as big,” says Steve. 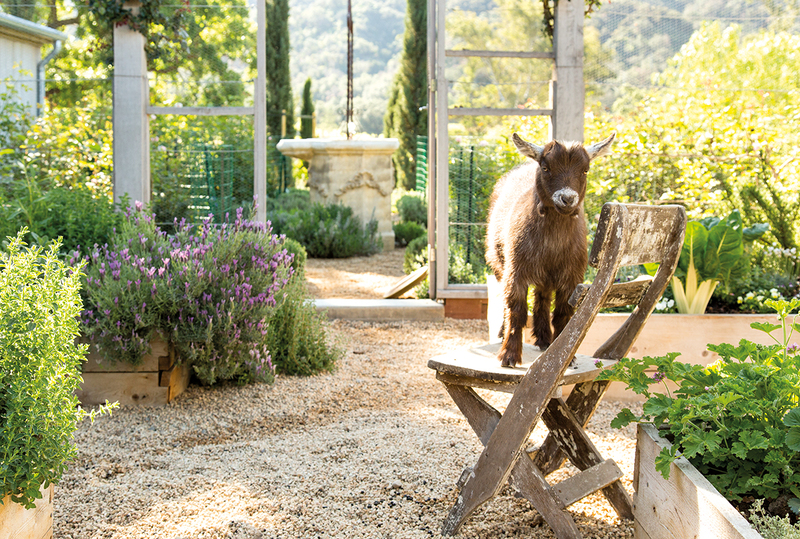 The same philosophy applies in the garden; a good thing, given the Giannettis share their outdoor spaces with a host of extended family members, including miniature Sicilian donkeys, African pygmy goats, and Silkie Bantam chickens. While all have their own dedicated areas thoughtfully designed to meet their needs—they also have run of much of the property. Visitors to Patina Farm are likely to be welcomed by a donkey ambling up the driveway (meet Buttercup and Daisy), and Thelma and Louise, the friendly goats who are always game for a good petting. Only a few gardens closest to the house are off-limits, as “the goats do tend to find most everything delicious,” says Brooke, with a laugh. But all the animals (including four dogs and a house bunny) are an inextricable part of the joy and rhythm of daily rituals. Indeed, the initial seed of an idea that led the couple to connect more closely with nature and a simpler pace continues to flourish and thrive, as do all who live on Patina Farm. 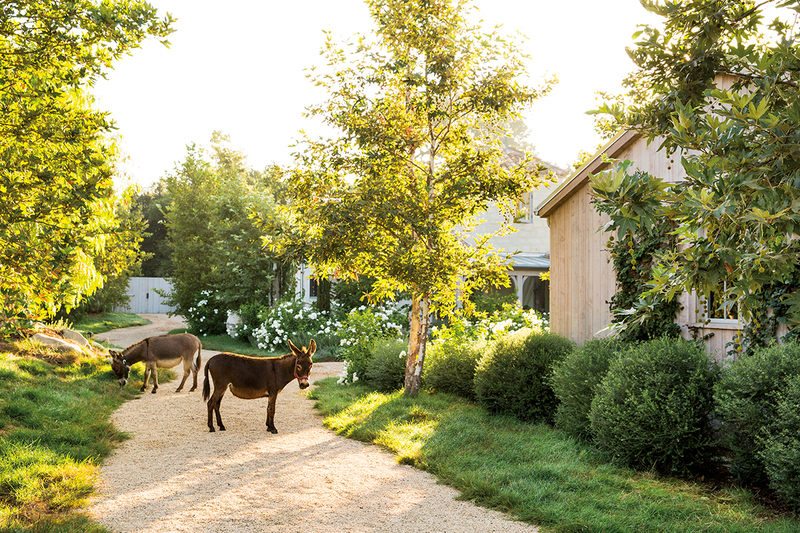 Visitors to Patina Farm in Ojai, California, often greeted by Daisy and Buttercup, two of four friendly miniature Sicilian donkeys that wander the property. Weathered wood beams and doors mingle with formal elements such as Gracie wallpaper panels that conceal a television. 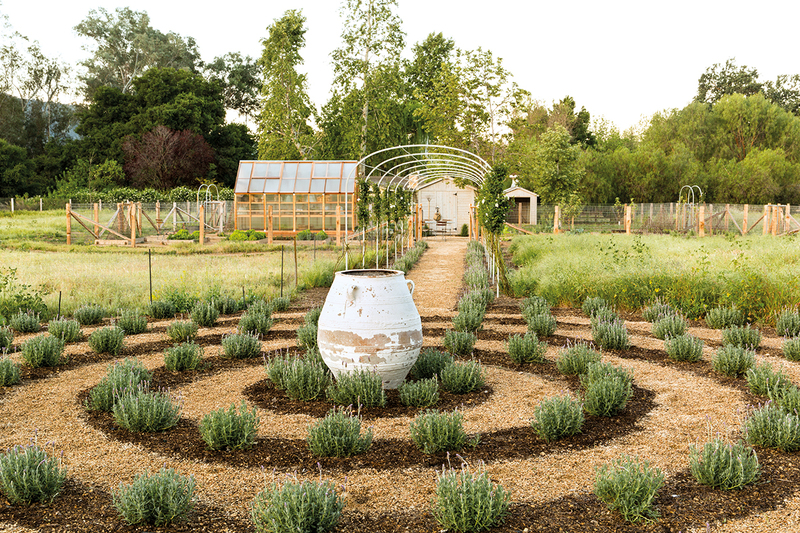 A large olive jar is encircled by a labyrinth planted with Spanish lavender. 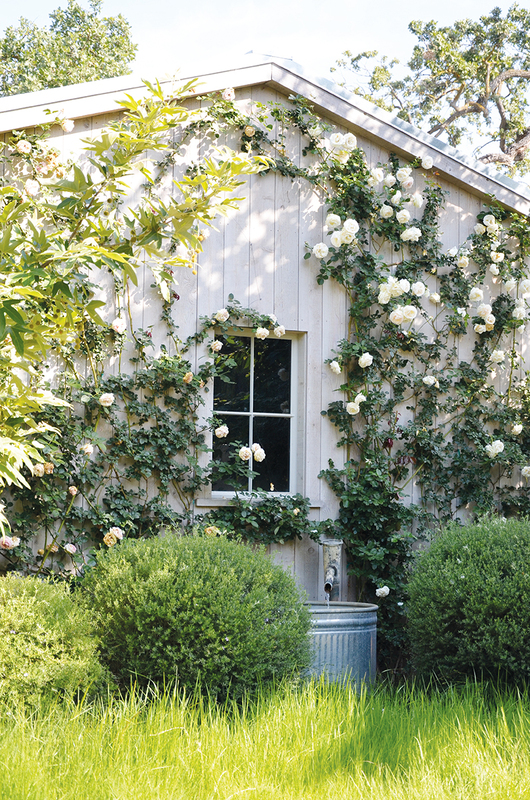 Roses scale a garage designed to look like a barn. 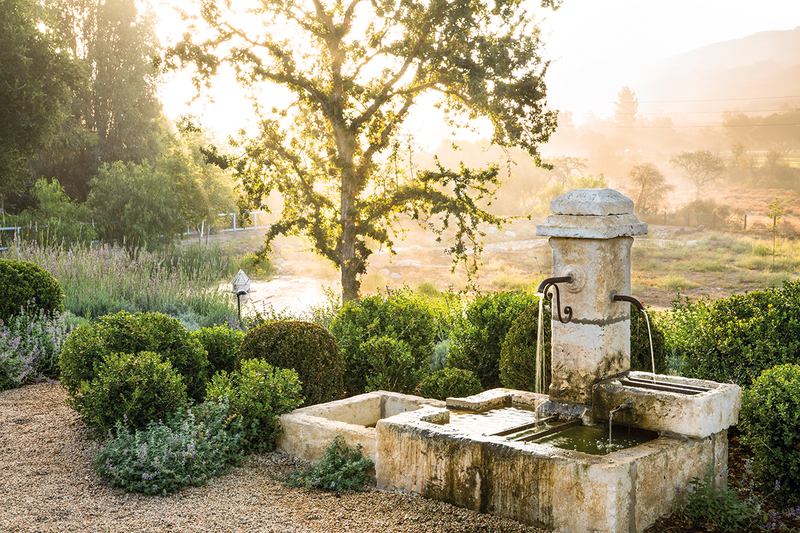 A rough-hewn limestone fountain reflects the couple’s love for patina. Splashing sounds, whether from water features or the ducks that inhabit the pond at the bottom of the property, become nature’s own version of background music. A glass wall and ceiling in the master bath appear to extend the room right into the garden. Fortunately a dense hedge provides plenty of privacy. Louise jumps up to say hello. One of Steve’s favorite places to relax is on the L-shaped sofa around a fire pit that looks like a campfire. 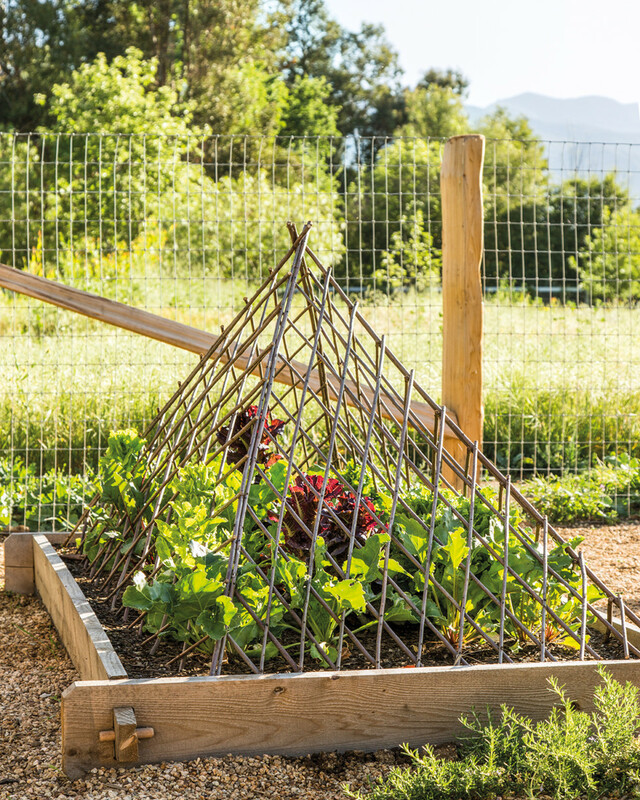 A trellis frames the charming goat garden, but nothing can contain the spectacular view of Black Mountain. 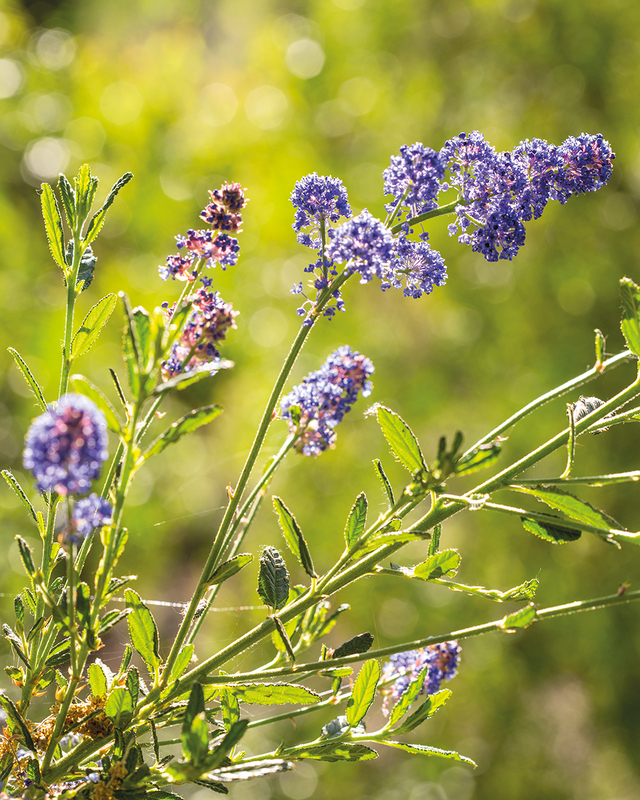 Ceanothus, also known as California lilac, fits in with the color scheme of both house and garden. 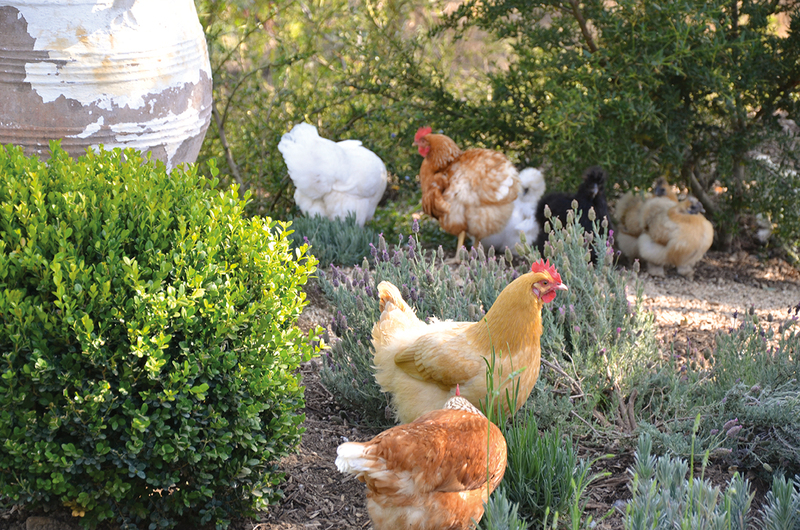 While the couple’s Silkie Bantam chickens have a stylish coop of their own, they also ramble throughout the property. 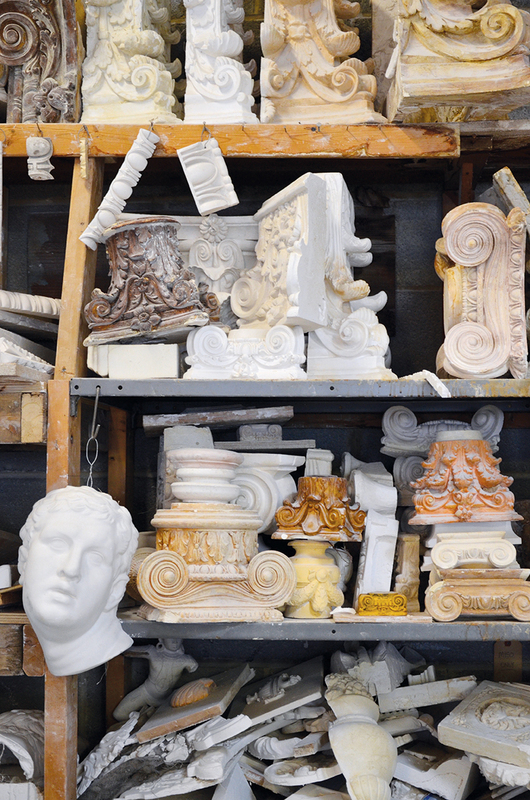 A collection of architectural fragments from Giannetti’s Studio, the ornamental plaster business that belongs to Steve’s family, provided inspiration for Patina Farm. PHOTOGRAPHS BY LISA ROMEREIN FROM PATINA FARM BY BROOKE GIANNETTI AND STEVE GIANNETTI, REPRINTED BY PERMISSION OF GIBBS SMITH.